Sometimes, I just see no photographs in front of my eyes. Such was the case one day at Brazos Bend Park. I had walked up and down this one path three times. I saw nothing that I wanted to photograph. Then I sat down and just starting staring at the lake. 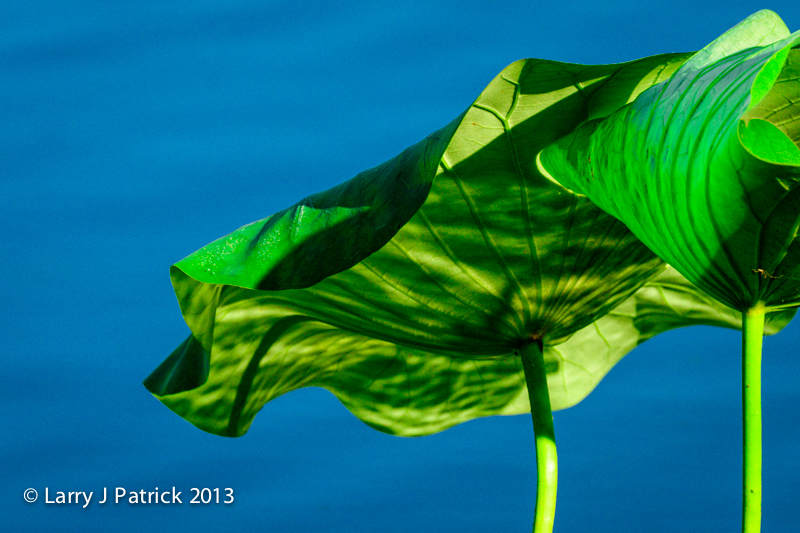 I immediately noticed how the light reflected off the water and onto the underside of the water plants. In today’s photograph, I wanted it to be about shapes and colors. Camera settings: Nikon D800 (DX format), 80-400mm f/4.5~5.6 at 600mm (effectively), ISO 1600, f/13 at 1/4000th of a second on a tripod. Lightroom 5—applied Nikon Vivid preset during import, set white and black points, added clarity, sharpness and vibrance and increased saturation of blue, green and yellow.